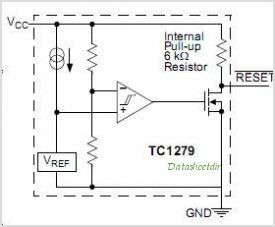 TC1278 The TC1278 TC1279 are cost-effective system super- visor circuits designed to monitor V in digital systems CC and provide a reset signal to the host processor when necessary. No external components are required. The open-drain output uses an internal pull-up resistor of approximately 6 k. The reset output is driven active within 5 s of CC falling through the reset voltage threshold. RESET is maintained active for a minimum of 250 ms after V CC rises above the reset threshold. The TC1278 has an active-high RESET output, while the TC1279 has an active-low RESET output, with both devices having an open-drain output stage. The output is valid down to V = 1.2V. Both devices are available in a 3-Pin CC SOT- 23 package. By Microchip Technology Inc. This is one package pinout of TC1278,If you need more pinouts please download TC1278's pdf datasheet. This is one application circuit of TC1278,If you need more circuits,please download TC1278's pdf datasheet.